If you see this lady walking along the highway, give her a wave - or even better, stop and give her some cash. 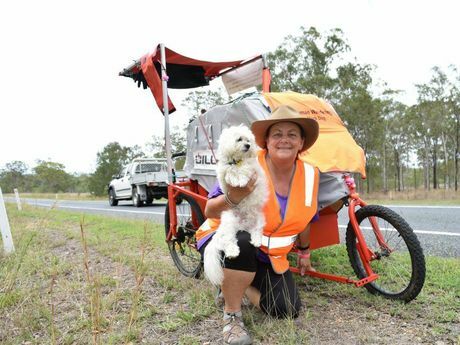 Tracey Humphyreys, from Currumbin on the Gold Coast is heading towards Gladstone after walking 700 kilometres from Bryon Bay. 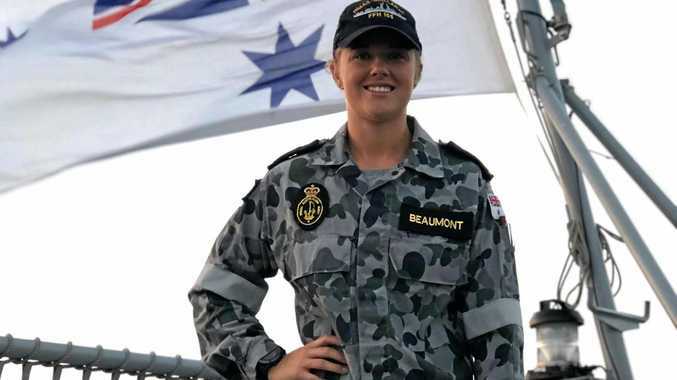 Her epic journey started on September 27, and so far she has travelled 700 kilometres, wearing out one pair of brand new shoes in the process. Ms Humphreys is raising funds for the Black Dog Institute, to make up for the reduction in funding of $50,000 by the Federal Government this year. "My goal is to raise $50,000 so the institute will not be out of money," she said when stopped on the Dawson Highway between Calliope and Gladstone this morning. Ms Humphreys said she almost lost her son to suicide three years ago, so she has a real affinity for the works of Black Dog. "I was one of the lucky ones. My son is now healthy and happy." Her first goal was to reach Gladstone, where she has family, so that she can get a few running repairs done on her buggy. "It was built for me by a young bloke in a mower shop, and it's doing really well. There are just a few things which will make it that much better," she said. She is very happy with her progress so far. When she first stepped out onto the road she was averaging around 20 kilometres a day. Now her average has increased to around 33 kilometres each day, and she said she is still building up her stamina. "I find by the end of a day's walk I'm pretty much hobbling to a stop, but I wake up in the morning now, ready to get back on the road again. Sleeping on the side of the road is not the place most would like to be, but for Ms Humphreys it's just the way it is. "I normally try to find a public parking area or something like that, and sleep under a picnic table. Saves me putting up my little tent, but I'm happy to have to use the tent as well." She has brought along her little white dog Dexter on the ride - "he's my little white dog raising funds for Black Dog". She said people along the way have been incredibly generous. "I've had so many wonderful things happen along the way. It's restored my faith in people. "I had to take Dexter to the vet, and they wouldn't let me pay - those sort of things are real kindness."